This weekend, Holly and I were invited to The Baby Show at the London Excel as guests of Dorel, the makers of Maxi-Cosi to try out the Maxi-Cosi Elea pushchair and travel system. Having owned a couple of Maxi-Cosi car seats in my time, I was interested to try out one of their strollers. I was given a demonstration of the Maxi-Cosi Elea and then we were sent on our way to try it out for ourselves. We swerved in and out of the busy crowds at the Baby Show and got to try out several of the features. I was instantly taken by the lightness and by the ease of use. 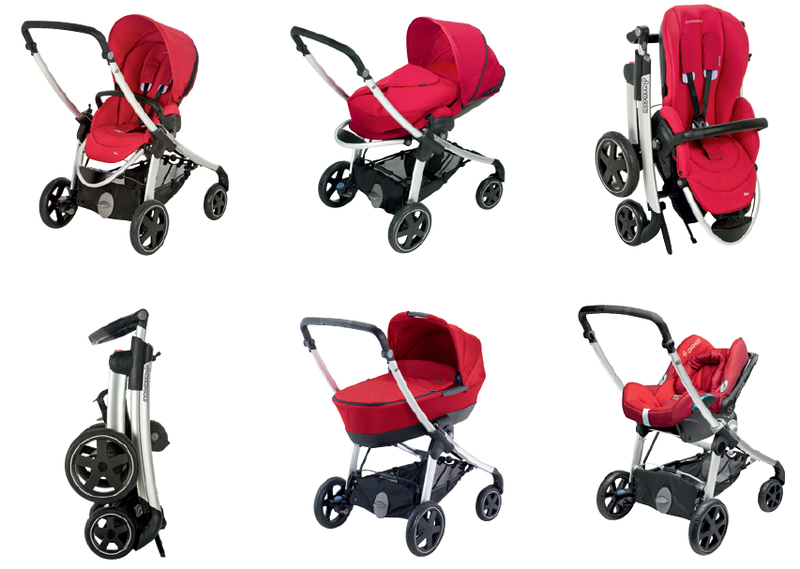 The Maxi-Cosi Elea has a single motion fold - click the buttons to release the chassis and it simply collapses... no folding required. To open it back up again you just pull the chassis upwards in a single motion and it pops out in front of you until it clicks into place. The most attractive feature of the Elea to me is its two-fold system. For every day usage you can fold the buggy with the seat unit attached (they call this the Daily fold) but if you are in need of extra space at home, or in your car boot you can take the seat unit off and further collapse the chassis so that it is ultra-compact (they call this the optimum fold). If you've read my blog for a while you will know that I get frustrated with a buggy if it takes up too much space in my car boot and I can tell you that the Elea, when fully folded, took up so little space in my car boot that I was able to fit the monster buggy in too! The seat unit is rigid which limits the overall compactness of the Elea a little. The Elea seat unit can be forward facing or rear-facing (I prefer Holly to be facing me at this age but as she grows older I know she will want to look out into the world). There are several recline positions including a totally-flat position for newborn babies (or in my case for a sleepy baby coming down with the flu). When the sun-visor is up and your baby is wrapped in the snuggly baby nest (included) then the Elea looks very much like a pram. However, if you do want it to perform even more like a pram you can buy an additional collapsible carrycot which attaches to the chassis. All Maxi-Cosi infant carrier Group 0 car seats are compatible with the Elea and it comes with adapters to make this possible. I really enjoyed using the Maxi-Cosi Elea. It was spacious without being heavy and I found the basket underneath the buggy to be well-sized and easy to access. For me, the most disappointing element of the stroller was the straps on the seat. The seat itself looks really smart and is padded and very comfy but the straps don't seem to live up to the quality of the rest of the buggy and I found them very hard to adjust. I also found that because the main handle of the Elea folds down when in 'optimal' fold, the joints on the handlebar make it feel a little unstable and wobbly to the touch. On the whole though, I'm really very impressed by the Elea and Holly certainly seemed extremely comfortable in it. The Maxi-Cosi Elea has a RRP of £400 but is available at some of the big named baby stores for some very attractive prices, for instance, you can currently find the Elea for under £320 Kiddicare .